Hunting season for western Oregon deer is underway and we have been issuing many permits at our office. If you are hunting and driving on our lands, please stay on rock roads. Driving on dirt roads can damage the road surface and cause erosion that can degrade water quality in streams. We have five separate logging operations on our lands during hunting season. For safety, please avoid areas of active logging operations. We are in the middle of our largest fall seedling planting effort in our history. Planting seedlings in the fall allows the roots to grow and develop before the tree goes dormant for the winter. We hope this allows for better growth of the seedlings in the following growing season. Crews can plant several thousand trees per day. Starker Forests will be offering forest education field trips to over 500 elementary school students, teachers and parents this fall. These fun tours at our interpretive trail near Blodgett allow students to learn about trees, plants, wildlife and wood products. Bus expenses are paid for through grants offered by the Oregon Forest Resources Institute. Starker Forests will begin advertising for our Chief Executive Officer position this month. Applications will be accepted in January 2017. See the Jobs section of our website for more information. Beginning Friday, July 29, 2016, the West Oregon District will implement our Public Fire Restrictions (Regulated Use) across the district. Current, and predicted weather, are forecasted to continue drying out forest fuels. Natural curing out of other fine fuels will also accelerate this time of year. All of these factors are causing our fire danger levels to increase to a point that conditions will warrant these additional prevention measures. We appear to be in a steady warm and dry weather pattern for at least the next week. Our indices are progressively moving towards increased fire danger levels. With that, the West Oregon District will go into fire season on Tuesday, July 5, 2016 at 0100 hours. The district will be at an IFPL-1 at that time. 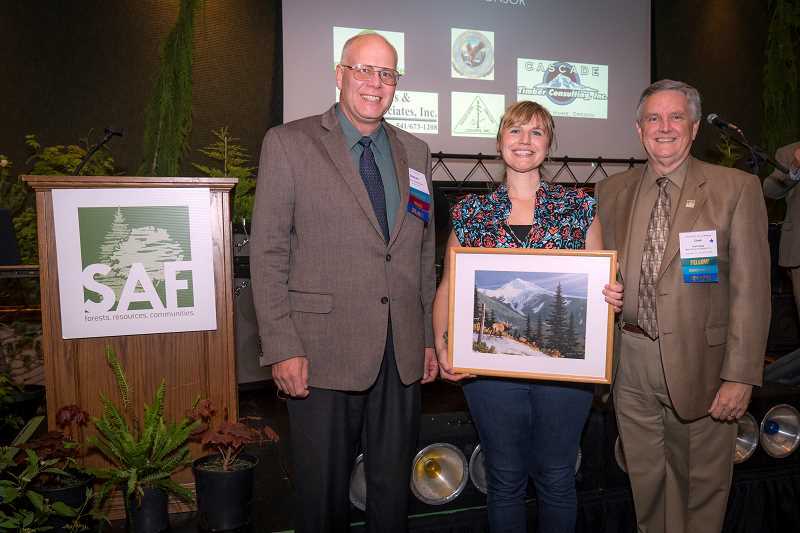 Hillsboro resident Fran Cafferata Coe has received the inaugural Young Forester Award from the Oregon Society of American Foresters (OSAF). The award is given to an OSAF member who has demonstrated outstanding leadership in the development and promotion of an individual program or project, or for a sustained leadership role benefiting the practice of forestry and the Society of American Foresters. Coe owns Cafferata Consulting, a small natural resource consulting firm specializing in helping forest landowners and managers understand how to effectively manage their forests for healthy wildlife populations and sustainable timber production. Coe graduated from Oregon State University with a bachelor’s degree in fisheries and wildlife science in 2000, with an emphasis in the interactions between forests and wildlife. She has more than 13 years of experience completing environmental surveys for sensitive, threatened and endangered plant and animal species. For the last four years, Coe has contracted with the Oregon Forest Resources Institute, where she leads the Wildlife in Managed Forests program, which supports OFRI’s mission of elevating public understanding of how forest stewardship meets social, environmental, and economic needs of both present and future generations. OSAF and its 15 local chapters represent all segments the forestry profession within the state. For over 25 years, the Mudslinger bike race has been a hallmark April event on the Tum Tum Tree Farm. Mike Ripley has a new course to offer racers for 2016. We hope you all have a great time! Check out the Mudslinger page for more info. Starker Forest has had a long history of offering free permits for recreation on our forestlands. In 2015, permits were issued for over 4300 recreation activities. We ask that permittees walk, run and bike on existing roads only. Recently, we have experienced an explosion of unauthorized trail construction and use on our property adjacent to the OSU Research Forests near Corvallis. In particular, we have found multiple sets of trail building tools on our Alder Creek Tree Farm. We have posted signs clarifying who owns the land and that the unauthorized trails are not ok and should not be built or used. The public is welcome to run and ride on existing roads on our properties with a free permit that is available at our office near Corvallis at 7240 SW Philomath Blvd. Concerns about liability and erosion caused by rampant trail construction and use, combined with the general philosophy of trespassing and using private property without permission, have caused Starker Forests to take action to stop unauthorized trail construction and use. Starker Forests is working in partnership with the OSU Research Forests and Team Dirt, a local chapter of the International Mountain Biking Association, to identify places where legal trails can enhance the recreation experience and should be built. Currently, the only authorized trail on our Alder Creek Tree Farm is the â€œUpper Skillings/McCullough Peakâ€ connector that connects the OSU Research Forests 790 road to our road system immediately west of McCullough Peak. Unauthorized trail building hurts the efforts of local trail advocates. Working with the landowner, as groups like Team Dirt have done, builds trust. Team Dirt, a nonprofit and volunteer organization, supports the stewardship of sustainable, multiple-use and purposed built trails, to preserve access for mountain bikers through advocacy and education, and to promote responsible trail use. Unauthorized trails will be blocked with signs, flagging and forest brush to make it clear to users that use is illegal. Forestlands in Benton County are patrolled by the Benton County Sheriffâ€™s Office. Starker Forests is a fifth generation family business that owns, grows and manages forests in Benton, Lane, Lincoln, Linn and Polk counties. Our primary business is commercial timber production. We are an active member of the American Tree Farm System.